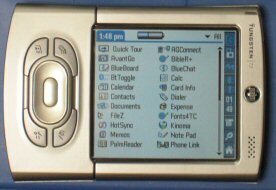 It was about a year ago that the Palm Tungsten T (T1) was announced to the public. Several months ago, Palm released the Palm Tungsten T2 (T2). Now, Palm is getting ready to officially release the third generation model, the Palm Tungsten T3 (T3). I believe everyone has been excited about this product ever since the rumors were announced earlier this year, even before the T2 hit the shelves. I can honestly say that it was worth the wait. The screen is simply awesome! This is one of the best, if not the best, screens I have seen on a PDA, period! The color quality, the brightness, and the sharpness of the display are excellent! Take that, and add that the fact that it is a high-resolution 320 x 480 display measuring 3.75 inches diagonally, you just cannot get much better. Surprisingly enough, you can view this screen outside, which is very unusual for this type of screen. With the added screen size, Palm incorporates virtual graffitti into the T3, which is a first for Palm. I have been waiting for this feature in a non-clamshell design, and Palm has done it. For those unfamiliar with virtual graffitti, it replaces the permanent graffitti input area found on most Palm devices with a temporary graffitti input area that is displayed on screen. Therefore, when the graffitti input area is not necessary, software can use the extra screen area to display other information. The virtual graffitti input area is displayed by default if software is not written to take advantage of the extra screen area. Below, you will see three different options for the virtual graffitti area. Note on the first option, the four large icons are customizable. Simply hold the stylus on the icon of choice until a list pops up, simply select the function or application you want. Very slick! Not only did Palm add virtual graffitti, but they took some pains to make sure the feature was very usable. For example, the screen automatically expands to fill the screen when you open the slider. In addition, Palm maximizes the use of the screen by adding the ability to rotate the screen 90 degrees. Therefore, you have a portrait mode (320 x 480) and a landscape mode (480 x 320). In portrait mode, the status bar and the virtual graffitti area are the bottom of the screen. In landscape mode, the status bar and the graffitti area are on the left side of the screen for left handed folks or the right side of the screen for right handed folks (setting available under Prefs -> Personal -> Handedness). Any application can be viewed in portrait mode or landscape mode, although some applications may not use the extra screen area. If applications do not use the extra screen area, the virtual graffitti area appears automatically. If applications do use the extra screen area, the software reacts accordingly, like the application launcher in the pictures below. On the inside, this Palm sports a 400 MHz X-Scale processor with 64 MB of RAM, a little over 51 MB available to the user. In comparison, the original T uses a 144 MHz OMAP processor with 16 MB of RAM. All applications are faster, and everything just pops onto the screen as soon as you tap on the screen. For all those SmartList To Go users (formerly known as ThinkDB), the T3 instantaneously sorted a 552-record SmartList To Go database. Everything just rocks right along. Very Impressive! This is the same wonderful form factor as the original. As far as dimensions, the T3 is a little longer, a little thinner, and a little lighter than the original. For me, the T3 feels better than the T1 or the T2. The device is metal with plastic ends and plastic running along each side. Below, you will see comparison pictures between the T1 and the T3 devices. The T3 is on the right or bottom of the following pictures. I love the status bar (shown below) that is on the screen all the time, whether you are in 320 x 320 mode, 320 x 480 mode, or 480 x 320 mode. This feature could be categorized under software, but with the slider of the T3, it essential to the function of the device. It has all the features you would want to access quickly, and I am sure third-party folks will make it even more useful. As shipped, it provides (in order left to right) a shortcut to get back to the list of applications, a shortcut to the find function, a shortcut to the menu, a shortcut to the system information (clock), a shortcut to the reminders, a shortcut to the Bluetooth settings, a shortcut to activate on-screen graffitti, a shortcut to rotate the screen, and a shortcut to enable the virtual graffitti area or to pick the style of graffitti area. If you hold the stylus on the Home shortcut, a list appears of recently used applications (shown below). The new 5-way navigation pad and application buttons are very responsive, but I thought this decision was less than optimum. Since the T3 can be used in portrait mode or can be rotated 90 degrees to be used in landscape mode, it would have been nice to keep the round 5-way navigator used with the T1/T2. Therefore, the feel of the control would remain consistent no matter which mode you used. At the same time, it is nice to have the bigger select button in the middle, but I never had problems with the small select button on the T1/T2. Thank you, Palm. You finally listened and responded to all the criticisms with the poor audio quality of the T1 and T2. The audio on the T3 is as good or better than any Palm or PPC device that can play MP3's. Quality and volume are both very much improved. They could have used or developed a better MP3 player, especially one that took advantage of the extra screen and the landscape functionality, but I guess you cannot have everything. For wireless capability, Palm has stuck with Bluetooth for the T3, and it is very stable (probably due to some software tweaks). The T3 connects and disconnects better than the T1 or T2 did with my Bluetooth USB adapter on my computer. I have yet had to reset my device while being connected. I do wish it had WiFi, but with the power drain, it is not essential to me. Personally, I would want a sled that attached to the back of the device with an extra power source and a strong signal. Most handheld devices have weak signals, and they drain the battery within no time. I understand the Palm Tungsten C has good battery life with WiFi enabled, but I have yet to experience it first hand. Anyhow, Palm has included a shortcut on the status bar to manage the Bluetooth connection (see screen shot below). Palm made one minor improvement pertaining to the SD card slot. The SD card slot has an actual flip door that protects the slot when a SD card is not installed. A lot better than the dummy SD card used in previous devices. The power button is a little more difficult to push than on the T1 or T2, but Palm may have incorporated this on purpose to prevent accidental power-on's of the device while in a pocket or a purse. Some will like this, and some will not. Personally, I use the double click of the select button to power it on. Something else worth noting, the voice memo button is larger than on the T1 or T2. This makes it much easier to use, especially if you like to hold the button down to record. The picture below shows the changes made to the SD card slot, the power button, and the voice memo button. With the Palm Tungsten T3, Palm stayed away from the clip-on plastic cover provided with the Palm Tungsten T and T2. This will be a very welcome change for most folks, but I was one of the few who actually liked the plastic cover. Using the plastic cover with the exposed 5-way navigator, I could easily access necessary information without removing the cover and with only one hand. Anyhow, Palm has included a leather flip cover with the T3 that clips on to the back, wraps around the top, and covers the front of the device. Even with the slider open, the cover is long enough to protect the screen. The new cover is well made and still provides one-handed use. With a flick of the wrist, you can easily flip the cover out of the way for accessing your information. If you are worried that the cover will depress the buttons of the device, you can relax. I have pulled the T3 out of my pocket many times, and the power of the device stays off. You still get a HotSync cradle with the T3, although there is one slight change. The power cord and the USB cable both plug straight into the cradle. Previous HotSync cradles have one cable connected to the cradle, while the power cord plugs into a Y-connector close to where the USB cable connected to the computer. I guess it is a personal preference, but I like only having the one cable on my desk. Not a big issue, but one worth noting. A picture of the T3 in the cradle is shown below. The T3 uses the same stylus used for the T1 and T2. It is metal with a plastic tip to write on the screen, and it is held in the device with some type of magnetic catch. An excellent design, and definitely one worth keeping! It may be silly to make such a big deal about a stylus, but it does make a difference. For all other devices, I use a third-party stylus. This is the only "stock" stylus I use on a day-to-day basis. The picture below shows the stylus in the extended and retracted position. The T3 includes an excellent list of bundled software. Versamail 2.6, Web Pro 3.0, Documents To Go 6.002 Professional, Kinoma Producer for Palm, and RealOne Player are all included with the T3. All take advantage of the extra space on the 320 x 480 whether you are in landscape or portrait mode, except for the RealOne Player. In addition, Palm has modified the standard PIM applications to use the extra space. Calendar, Contacts, Tasks, and Memos all use the 320 x 480 screen whether you are in landscape or portrait mode. Note Pad takes advantage of the extra screen space, but only in portrait mode. In addition, some enhancements have made to the standard PIM applications. Date Book is now called Calendar. Address is now called Contacts. To Do List is now called Tasks. Memo Pad is now called Memos. Calendar has an agenda view that contains calendar entries, task entries, and number of e-mails read. A new year view and a new month view take advantage of the extra screen area for easier planning. Contacts adds the ability to have three different addresses for each contact, as well as, nine custom fields and a birth date field. Tasks gets a few changes, also. You are able to set alarms for each task, and the task view gives you the ability to sort by date (i.e. Due Today, Last 7 Days, Last 7 Days, and Past Due). Last, but not least, Memos increases the maximum size of a memo from 4 KB to 32 KB. Finally! With all these changes, Chapura's Pocket Mirror is not bundled with the T3. Palm uses their our software to do the synchronization that is setup when you install the desktop software. For all the screen shots of all the different applications, go to the Palm Tungsten T3 Screen Shots. As mentioned earlier, the Web Pro 3.0 browser is included with the T3. This version gives the user the ability to use it with or without a proxy server. There a lot of other options that make this an excellent handheld browser. Here are a couple of screen shots showing Web Pro is portrait and landscape mode. Security has been improved, especially with the Security add-on available on the web. I was able to download it while it was accidently made available on the downloads page on Palm's official support site. It allows you to encrypt (RC4 and AES encryption) data on the handheld before you lock your device. You pick the applications you wish to encrypt when the device locks. It takes a some time to encrypt the data when you turn off the device and to decrypt the data when you turn the device on, but it effectively handles any security issues you may have. Here are a few screen shots with the options mentioned. I was hoping for better battery life, but it is as good as, or better than, the battery life on the T1 or the T2. When you consider it is the same size as the T1 and T2 and that it is powers an excellent 320 x 480 screen, Palm did something different. For a real world scenario, I was reading e-mail and web site pages via Bluetooth while listening to music for about an hour. Then, I continued to listen to music for another hour while the Bluetooth radio was on, but not connected. When I got to work, the battery was still at 40%. Not bad at all, in my book. By the way, I did have the screen brightness set on it's lowest setting. Note: There is actually some debate to the size of the battery, but I have not found a specification to confirm it's capacity. All pictures used in this review are among all the other pictures available on this site. To view these pictures and more information on the Palm Tungsten T3, go to my Palm Tungsten T3 Page. In addition, I have put together a FAQ Page that will address common questions that are sent in to me. Thank you.